With its dense system of rivers and canals, Vietnam’s Mekong Delta has become famous for floating markets which attract tourists with their abundant farm produce sold directly from boats. Located on the Cai Rang river, 6 km from Can Tho city, the Cai Rang floating market is one of the most popular sites in Can Tho. Visitors need only 30 minutes to go from the Ninh Kieu port to Cai Rang by boat. One of the three most popular floating markets in the Mekong Delta, Cai Rang is always crowded with buyers and sellers aboard hundreds of junks and motor boats mingling on the water since early dawn. Normally, gloating markets are open from 3 a.m. to 9 p.m. but in the weeks before the Tet holiday, the markets are open all day. At the Cai Rang market, tourists photograph the many boats full of fruit and other produce, sample the great variety of food specialties of the Mekong region, and visit one or two of the floating cafes and pubs. The vendors hang their products on a pole so customers can see them from a distance. The Rough Guide calls the Cai Rang Floating Market one of the ten most impressive markets in the world. Huynh Thi Ut sells pineapples at the floating market. "The market starts at 1 am with the boats going back and forth. This year we had a bumper harvest and can sell our products at a very good price,” she said. Since the 18th century, the Cai Be has convened at the meeting point of Vinh Long, Ben Tre, and Tien Giang province. 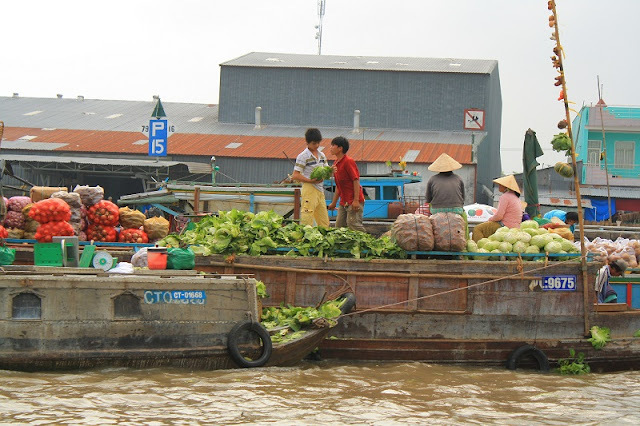 The oldest floating market in Tien Giang, Cai Be attracts a profusion of tourist-laden boats. The market looks like something out of a watercolor painting, flanked on both banks of the river by gardens and lines of coconut trees, a typical sight in the Mekong Delta. The wares include fruit, poultry, seafood, household goods, and textiles. The market is busy from 2 a.m. to 8 a.m.
Where seven branches of the Mekong River and canal system converge in Nga Bay town, Hau Giang province, you’ll find Phung Hiep, one of the most famous and bustling floating markets in the Mekong Delta. Established in 1915, the Nga Bay, or Phung Hiep Floating Market is one of the oldest in the region. The French spent 10 years digging the Xang Canal to ease commercial traffic to other waterways in the delta, a project that gave birth to the Phung Hiep market. The daily market is packed with produce and household goods. The main attraction for tourists is watching the colorful scene of boat traders selling tropical fruits. Smaller boats weave their way between the bigger boats, serving snacks and drinks to hungry sellers and buyers. Ut Lan sells noodles on her boat at Phung Hiep market. "Most of the time I live and work on my boat and only go to town when I have free time. My parents live in the countryside and earn their living from farming. I sometimes visit and help them during the harvest season," said Lan. Last month, the US news website Business Insider named the Mekong Delta as one-of-a-kind destination for year-end travel, saying visitors should not miss out the unique local floating markets. What's In The Halong Bay One Day From Hanoi?